The Commonwealth of the Philippines was attacked by the Empire of Japan on December 8, 1941 nine hours after the attack on Pearl Harbor (the Philippines are on the Asian side of the international date line). The United States of America controlled the Philippines at the time and possessed important military bases there. 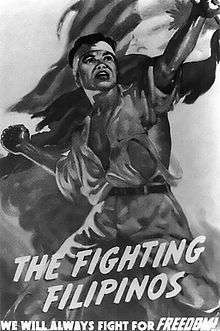 The combined American-Filipino army was defeated in the Battle of Corregidor by April 1942, but guerrilla resistance against the Japanese continued throughout the war. Uncaptured Filipino army units, a communist insurgency and supporting American agents all played a role in the resistance. Due to the huge number of islands, the Japanese never occupied many of the smaller and more minor islands. Japanese control over the countryside and smaller towns was often tenuous at best. In September 1940, Germany, Italy, and Japan had allied under the Tripartite Pact. The United States banned the shipment of aviation gasoline to Japan in July 1940, and by 1941 shipments of scrap iron, steel, gasoline and other materials had practically ceased. Meanwhile, American economic support to China began to increase. Japan and the USSR signed a neutrality pact in April 1941 and Japan increased pressure on the French and Dutch colonies in Southeast Asia to cooperate in economic matters. 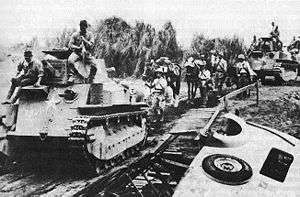 Japanese forces occupied the naval and air bases of southern Indochina on 22 July 1941. The Philippines was almost completely surrounded. A campaign for independence from the US which had been ongoing since 1919 resulted on January 17, 1933 in the passage by the US Congress of the Hare–Hawes–Cutting Act over the veto of President Herbert Hoover. The law promised Philippine independence after 10 years, but reserved several military and naval bases for the United States, as well as imposing tariffs and quotas on Philippine exports. Philippine Senate President Manuel L. Quezon caused the legislature to reject the bill. Subsequently, the Tydings–McDuffie Act, which eliminated provisions for US military reservations and substituted a provision for "ultimate settlement", became US law on March 24, 1934 and was accepted by the Philippine legislature on May 1. The impact of this on the future defense of the Philippines with the establishment was to prove disastrous. During the 10 year transition period, the Philippine Constabulary was vested with an ever increasing responsibility for defending the borders of the Philippines. The forces of the US Army settled at around 10,000 men. The US army had, however, already spent millions constructing Forts, and air strips throughout Luzon. This included the harbor defenses in Manila Bay, at Fort Mills on Corregidor Island and at Grande Island in Subic Bay. There were also bases at Nichols Air Station, now Villamor Airbase, Nielson Air Base (now Makati City—Ayala and Buendia Avenues lay over the original landing strips), at Fort William McKinley (now Fort Andres Bonifacio and the American Cemetery), Camp Murphy (now Camp Aguinaldo and Camp Crame) in Quezon City, Camp O'Donnell in Tarlac and a series of airbases and army installations in Pampanga including Fort Stotsenburg, Clark Air Base, as well as Camp Wallace in La Union, the Naval Station in Sangley Point, Cavite City, Camp Keithley in Lanao, Camp Eldridge in Los Baños, Laguna and Camp Henry T. Allen in Baguio City. Other fields in Tugegarao, Aparri, Isabela, Nueva Ecija, Legaspi, Bataan, and Del Monte in Davao were also built using US funds prior to and during the first years of the 1935 provisional Commonwealth. The date for Philippine Independence and US Military withdrawal was approaching, resulting in a reduction in funds from the US Military to directly support the expansion of the Philippine Army. Twelve Million US dollars were provided to the Commonwealth for the establishment of the Philippine Army in 1936. In the early years of the Commonwealth, the Philippine Army was composed of an Active Duty and a Reserve Component. The Active Duty component was the Philippine Constabulary, which was a para-military organization. After the outbreak of the war, this was referred to as the First Philippine Division. Many of the officers of the Philippine Army and Philippine Army Air Corps came from the members of the Philippine Constabulary and Air Constabulary. On July 25, 1941, US Secretary of War Henry L. Stimson requested that US President Franklin D. Roosevelt issue orders calling the military forces of the Commonwealth into active service for the United States. Stimson explained, "All practical steps should be taken to increase the defensive strength of the Philippine Islands." The following day President Roosevelt froze all Japanese assets within the United States and issued orders to absorb the forces of the Philippine Army. That same day the War Department created the US Army Forces in the Far East (USAFFE) command, with jurisdiction over the Philippine Department and the military forces of the Commonwealth. At the same time General Douglas MacArthur was recalled to active duty and designated the commander of USAFFE. MacArthur ordered the mobilization of the Philippine Army beginning on September 1. Elements of 10 Filipino reserve divisions were to be called into the service of the United States Army by December 15. Battalions were not organized by the time of the Japanese invasion in December. However, a force of a hundred thousand or more Filipinos was raised. On August 14 Brigadier General Leonard T. Gerow argued that the Philippine Department could not resist a Japanese attack. 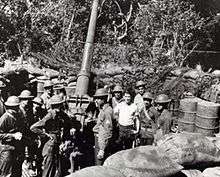 He thus recommended that the Philippines be reinforced with anti-aircraft artillery, modern aircraft and tanks. On August 16, MacArthur was informed that by September 5 he could expect the 200th Coast Artillery Regiment (AA), the 192nd and 194th Tank Battalions and a company of the 17th Ordnance Battalion. On September 5 Marshall asked MacArthur if he wanted a National Guard Division, probably the 41st. MacArthur replied that he did not need any additional divisions. He also stated, "Equipment and supplies are essential. If these steps are taken, I am confident that no such backing, the development of a completely adequate defense force will be rapid." By November the War Department had approved additional reinforcements of 1,312 officers, 25 nurses and 18,047 men. The 34th Infantry Regiment was scheduled to ship out from San Francisco on December 8, 1941. By December 5 fifty-five ships were en route from San Francisco carrying 100,000 ship-tons of cargo to the Philippines. On board were the personnel and equipment of the 26th Field Artillery Brigade, including the 147th Field Artillery, 75 mm, Truck Drawn, Regiment of the South Dakota National Guard; the 148th Field Artillery, 75 mm, Truck Drawn, Regiment of the Idaho National Guard and the 2d Battalion of the 131st Field Artillery, 75 mm, Truck Drawn, Regiment of the Texas National Guard. These units were diverted to Hawaii and assigned to its defenses. When the Japanese attack on Pearl Harbor took place, there were several air elements en route. This included 52 A-24 Banshee dive bombers of the 27th Bombardment Group (L), eighteen P-40s of the 35th Pursuit Group, 340 tons of bombs and 9,000 drums of aviation fuel. There were also two light field ground echelons of the 7th Bombardment Group (H), which arrived in the Philippines and were relocated to Mariveles after the evacuation of Manila. 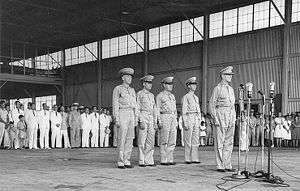 The air echelon squadrons of the 7th were en route to the Philippines and arrived in Pearl Harbor on the morning of Dec 7 1941. They consisted of 9th, 463rd, 492nd, and 493d Heavy Bombardment Squadrons. The air ecehlon was diverted back to the US and then routed to Java through Australia. During August, MacArthur had requested 84,500 Garand rifles, 330 .30-caliber machine guns, 326 .50-caliber machine-guns, 450 37mm guns, 217 81 mm mortars, 288 75 mm guns, and over 8,000 vehicles. On September 18, he was informed that, because of lend-lease commitments, he would not receive most of these items. As a result, the Philippine Army was forced to continue using Enfield and Springfield rifles. The Japanese viewed all the lands of Asia to be the rightful property of the Imperial Japanese Government and the Emperor. The land invasion of Korea, China and parts of Russia, which had begun at the turn of the 20th century, had been taking an upswing. The Japanese had been kept from realizing their goal of unifying or dominating the Asian lands by the presence of foreign military forces in the Philippines (United States), Hong Kong, Malaysia (United Kingdom) and the Dutch East Indies. Japan had hoped that they could strike fast and hold off reinforcements long enough to broker a peace accord from a position of strength. ↑ Saburo Ienaga (16 June 2010). "The Greater East Asia Co-Prosperity Sphere: Liberation or Exploitation?". Pacific War, 1931-1945. Knopf Doubleday Publishing Group. pp. 153–180. ISBN 978-0-307-75609-1. ↑ Alice Miller; Richard Wich (20 January 2011). Becoming Asia: Change and Continuity in Asian International Relations Since World War II. Stanford University Press. p. 7. ISBN 978-0-8047-7151-1. ↑ Alice Miller; Richard Wich (20 January 2011). Becoming Asia: Change and Continuity in Asian International Relations Since World War II. Stanford University Press. pp. 7–8. ISBN 978-0-8047-7151-1. ↑ "Chapter 23: World War II: The War Against Japan". Center of Military History. United states Army. 27 April 2001. ↑ "Imperial Japan". History. AETN UK. Retrieved 14 November 2014. ↑ "Japan's Quest for Power and World War II in Asia". Asia for Educators. Columbia University. 2009. Retrieved 13 November 2014. "World War II in the Philippines". Official Gazette (gov.ph). Retrieved April 9, 2012.